Sending military mail or receiving packages purchased online when deployed overseas can be costly if you do not know how to use the APO/FPO addressing system. Basically, the APO/FPO mail system allows people in America to send mail overseas at domestic rates. You only have to provide standard domestic postage on mail going to an APO or FPO address. If you pay 47 cents for a stamp to mail something within the continental United States, it only costs 47 cents to mail it overseas as long as you have an APO / FPO / DPO address and associated ZIP code. 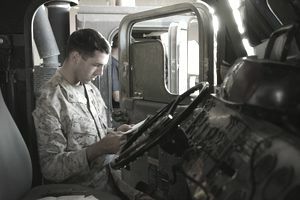 The United States Post Office delivers APO and FPO mail to a military facility, located on the East Coast or West Coast of the United States (depending on where the member is stationed/deployed), and the military takes over from there, transporting the mail via military cargo aircraft to the overseas location or Navy ship. In the 1980s, the Military Postal Service Agency (MPSA) was created to perform the task of delivering mail worldwide to its members. It is a joint military staff headquartered in Washington, D.C. The United States Postal Service (USPS) rules, regulations, and various international laws and agreements apply to the MPSA as it is responsible for the movement of military mail into over 85 countries. Formerly, each branch of the military had its own postal service and ways it operated. Now, the MPSA is the single point of contact with the USPS. The Mission of the Military Postal Service Agency is to "achieve efficient and responsive processing, transportation, and distribution of personal and official mail within the Department of Defense." Military and Diplomatic Mailing System is a global mailing system for United States members of the military and foreign service branches of the government. Every base or diplomatic embassy or consulate will be part of its own zip code. APO stands for Army/Air Force Post Office for bases overseas. FPO stands for Fleet Post Office and is for the Navy/USMC bases and ship abroad. DPO is another US Post Office that sends mail to the US Embassies worldwide. DPO stands for Diplomatic Post Office. You may have a Marine or State Department member who uses this addressing feature. The suffixes designate which U.S. Military Post Office the packages will be delivered to within the United States before overseas transporting occurs. Mail sent to an APO/FPO address will go to California, New York, or Florida depending upon the suffix. Once it arrives at one of these locations, the USPS has handled its end of the transaction. Next, it's up to the Military Post Office to get the package to an overseas member. If you are ordering something online for an overseas installation, do not add the country the package is going to. The APO/FPO or DPO and suffix/ZIP code is sufficient. Some online shipping fees will increase to foreign shipping if it sees a foreign country in the address.